Zhao Changlu is a happy man. He can till 4 mu (2,800 sq m) of arable land again. The 57-year-old resident of Nanchong city in Sichuan had 4 mu of land to begin with, but lost 2 mu in the hills to the country's forest conservation and soil-erosion prevention program. The extra 2 mu he tills today comes from a neighbor, who has found work in Guangdong. Many of the farmers who still live in the villages, too, are seeking other ways to make extra money. Many of them lease out their land to yezhu, or commercial farmers. Some of them even end up working for yezhu. Such incidents are becoming common in the countryside as more and more young farmers move to cities in search of better money. This is very true of Sichuan, which an ancient Chinese saying describes as the food bowl of the country. It is such developments that pose a greater challenge for China in its bid to secure food supply and develop the countryside. "The domestic demand for food is huge given the country's 1.3 billion population. Hence, we should be cautious with grain exports," says State Grain Administration (SGA) researcher Ding Shengjun. The government has taken many steps to ensure food safety. It has banned the use of corn in new ethanol plants, removed the 13 percent export tax rebate on wheat, corn, soybean and flour products to discourage exports, and scrapped agricultural tax and granted subsidies within the WTO framework to encourage farmers to grow more grains. Also, it has introduced a minimum purchase price regime for some crops to make sure farmers get an acceptable level of return even when prices fall. "It's the most effective method to encourage farming," says Xiao Haifeng, professor in China Agricultural University. But such measures have not been able to remove the uncertainties associated with grain production and, as analysts say, the situation could deteriorate. The present indeed looks rosy, with last year's grain production set to exceed 500 million tons. Many critics would argue that a fourth consecutive year of increase in grain production leaves little room for concern over food security. But the fact is, there's no guarantee the momentum will continue. In fact, the government is still trying to find ways to keep it up. It is true that the natural cycle of two years of bumper crops followed by a year or two of drop in output has been broken. Last year, summer crop production rose 1.3 percent year-on-year; early rice output remained stable, while autumn grain production increased slightly, says Li Guoxiang, researcher with the Rural Development Institute, affiliated to the Chinese Academy of Social Sciences (CASS). But the rate of growth has fallen over the past couple of years. As a result, few experts would hazard a guess on this year's grain output. "It's risky to forecast because there are major variables, such as weather", which played havoc with agriculture last year, says Xiao. 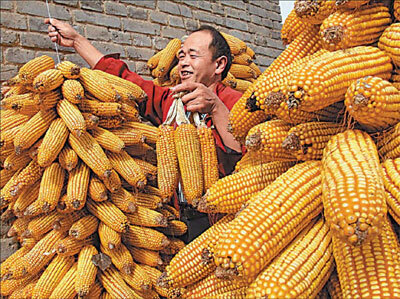 The loss of crops because of weather conditions from January to September was 44.8 million tons, up 22 year-on-year, says Gong Xiqiang, deputy head of Xiangfan city's grain administration in Hubei. Which means uncertainty is still a reality. Just about an eight-hour drive takes one from Nanchong to Tongjiang county in northeast Sichuan where Ju Hua lives. The 61-year-old farmer is a resident of Sichuan basin, which the Ministry of Science and Technology describes as a "cold center". Why? The temperature has been rising across the globe, but scientists have not found any "significant sign" of global warming in the basin, which is about three times the size of the UK and borders the Qinghai-Tibet Plateau. Ju and other farmers in Sichuan and neighboring Chongqing municipality may have been spared the consequences of global warming, but they and the others who make up more than 110 million people in the area have suffered extreme weather in the past two years: a drought in 2006 and devastating floods last summer. Nearly half of the town was flooded last year, says Ju. Massive landslides claimed at least 20 farmers' lives in a village a dozen kilometers from Ju's town. Many houses were destroyed or damaged in the floods and landslides. "People have become even poorer, and the government treasury even tighter," says town administrative chief Wang Youzhong. During the past few years, Ju's family has suffered either because of drought or water shortages. And rice cultivation has been hit because the village's two small reservoirs have become essentially useless.